This is the third post we have done here on the OCNA blog covering the epic eight day Canoe trip (nine days to reach the final destination, the village of Fort Albany, Ontario), to find the world’s then oldest unfound Geocache, the elusive 4.5lb Walleye, placed by Jamie Matear way back on June 21st, 2001. 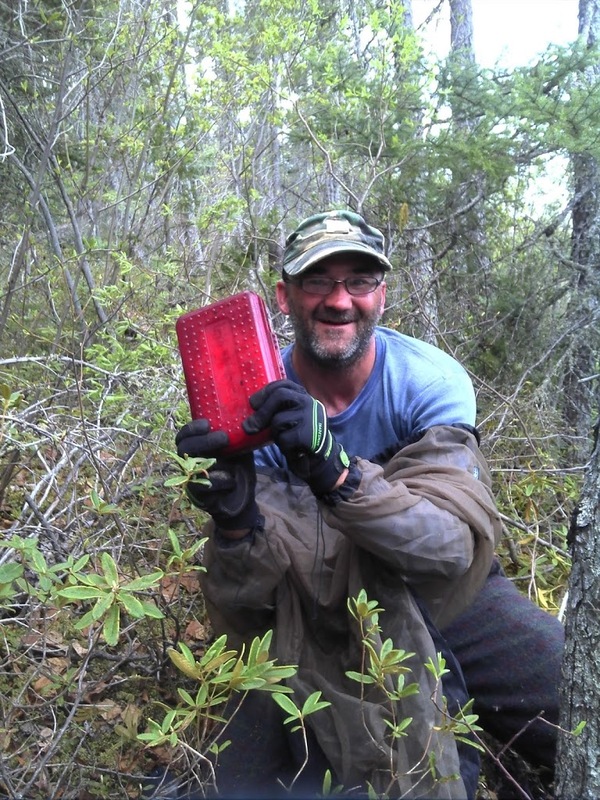 This journey was undertaken by Chris Wereley, AKA Stormgren-X, of Sudbury, Ontario Canada, and his long time friend Gordon Morris, a non-Geocacher. This involved a 400 Km (250 Mile) paddle from Limestone Rapids, just North of The Constance Lake First Nations, and NW of Hearst, Ontario, to Fort Albany. The Rivers traveled on were The Kabinakagami, The Kenogami, and finally, The Albany, 1 Km (.6 Mile) wide in spots. The 4.5lb Walleye cache being along The Albany River, only 65 Km (40 Miles) shy of Fort Albany. 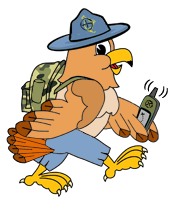 This is one of the biggest stories in Geocaching in years, and was completed a month before this blog post, so we assume readers are at least somewhat familiar with the story. If you’d like to become very familiar with their trip, you can download Chris’ 29 page journal as a .pdf from wikisend.com, a file that is only available for 3 weeks from the date of this blog post. Chris has also let us host this 29 page .pdf on our server at http://www.opencaching.us/AlbanyRiver-4.5lbWalleye.pdf but your web browser and internet connection will pay the price!! We will eventually convert that to an HTML page. On with the interview! OCNA Blog: What did you two eat during this 9 day trip? By the way, I had to Google what a Bannock was. Did you catch and eat any fish? Chris: We brought and ate mainly dried and dehydrated foods. Some instant meals that you just add hot water to, dried meats, instant mashed potatoes, dried fruits, nuts, trail-mix, bannock, granola, powdered milk, gatorade powder, cheese, crackers, chocolate, onion, garlic, tea. The only liquids we brought were honey and a small bottle of after dinner drink to sip on. We attempted to catch fish, but the water level made for poor fishing. Even the First Nations people were not having much luck, and they also told us this was due to high water levels and the water being “dirty”. This area usually has a great abundance of fish. OCNA Blog: How about drinking water? Did you just boil water, or use purification tablets? The first river, the Kabinakagami, didn’t look very drinkable! Chris: All the water was boiled using a Kelly Kettle, some of the water had sediment suspended in it, but it was a very fine sediment and it didn’t bother us. The Kabinakagami river did have a lot of sediment in it, but after boiling was ok to drink. We did try to filter it with a ceramic filter and pump, but the sediment was so fine that a lot of it went through the filter. Boiling kills everything I suppose, and we didn’t have any side effects. 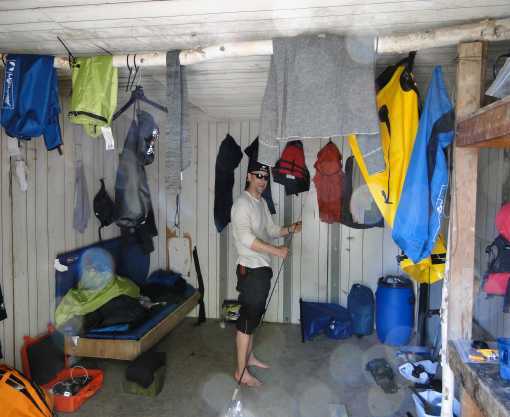 OCNA Blog: I was amazed by the amount of gear you two were carrying in the pictures from the tin cabin near Mammamattawa. Was the barrel for food only, or did you stow other gear in it, in case the unthinkable capsizing of the canoe happened? Chris: The canoe was rated for about 700 lbs. of total weight, and we were well under the maximum. The barrel was for food only, and the rest of the items were kept in dry bags and we kept all our electronic gear in a Pelican water proof case. Getting gear and food wet in the event of rain or capsizing would pose a problem. OCNA Blog: Did you encounter any mentionable rapids on this entire trip? From some of the videos posted, it looks as if the water was flowing fast enough that you could just float down these rivers. Chris: We did encounter some minor fast water and rapids. Nothing of the kind we are accustomed to in the rocky and hilly Canadian Shield. The high water levels we encountered in the rivers also contributed to smoothing out the rapids as the rocks were well below the water surface. There are a dozen or so rapids listed on this route, and are more challenging during mid-summer water levels. 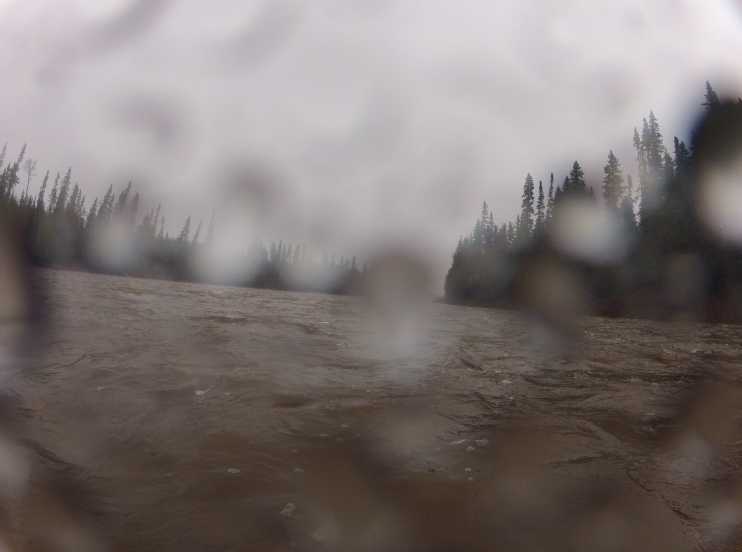 Some of these rapids need to be lined during lower water levels to prevent canoe damage. One could just ‘float’ down these or any rivers, but the trip time would be extended greatly. At least once a year, the First Nations people build a raft and do just that. Float along the river all day and night. We heard a story about one guy who built a raft and placed a brand new truck on it to bring to Fort Albany and made it! Out of the 8.5 days, we traveled for 7 days, making good time due to high water levels and stronger current. OCNA Blog: I assume you were very happy with your Goal Zero solar battery charging device? (NOTE: The device can be seen in this video, and an iPod rocking The Doors can be heard). Chris: The Goal Zero solar powered battery charger worked very well for us during the trip. It kept all our devices charged and worked as advertised. Of course it works best under full sun and we were able to take advantage of that during sunny days. It charges the battery pack that can hold AA or AAA batteries, and then in turn, the battery pack will charge any device that can be charged via USB. They do make quite a few different solar powered products. OCNA Blog: As someone who was closely watching everything on the SPOT tracking device, I saw you stop for lunch short of Ghost River, and was wondering if you were actually going to stop there. But you did, and spent a few hours there. That had to be one of the most interesting stops during the trip. 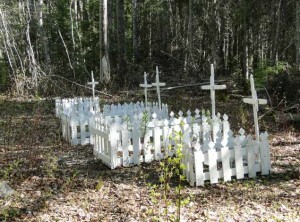 Do you have any idea who is maintaining the cemetery there, some 60+ miles against the current from Fort Albany? Chris: Ghost River was one of the spots that we did want to stop at and explore a little. We had read about the graveyard from a 1983 trip report and wanted to see if it was still there and also see if we could find remnants of buildings. It was one of the highlights of the trip and we do not know who maintains it. Someone still cares and respects these hardy pioneers from the past. Apparently there are some old First Nations burial sites along these rivers as well. 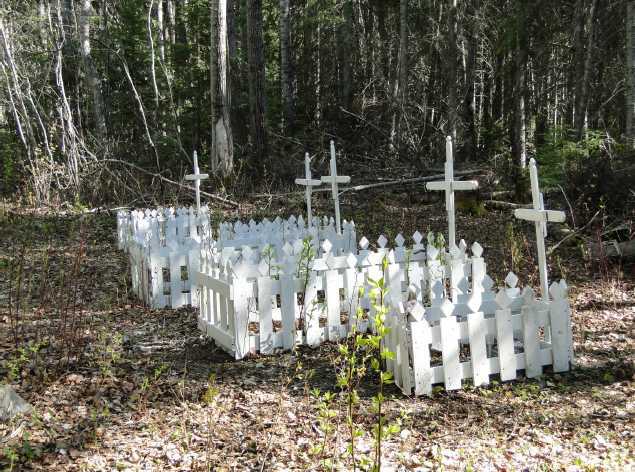 We did see one other cross up on the river bank on the Kenogami river that we did not investigate as we were on the other side of the river when we spotted it. (NOTE: The 1983 trip report, a blog post, can be seen here). OCNA Blog: The SPOT tracking device tells us you spent about 2.5 hours in the area of 4.5lb Walleye. How long did you spend actually looking for the cache? It sounds like it was pretty much “buried”. How deep under Moss would you say it was? Chris: We didn’t measure the time we spent at GZ, but estimated a few hours once we set off again on the river. We probably spent about 1.5 hours of actually searching for it. I say at times we were “digging”, but at no time did we need a shovel or other digging instrument. The container was placed under moss as per described on the cache page. It was under perhaps four inches of moss. OCNA Blog: I was surprised at how many other people you saw out on these rivers during the trip. I assume everyone is very friendly and helpful out there in the wilderness? Chris: We were surprised as well to see so many people during the first part of the trip to Mammamattawa. There were boats on the river and float planes coming in! Just happened to be there when the First Nations peoples were having a gathering from the different communities. After we set off again from Mammamattawa on day 4, we only saw one other boat heading upstream on the opposite bank until day 8. All the people we met along the river were very friendly and helpful. I found that once you approached them and showed some courtesy and respect, the same was given back. After all, we were in their neck of the woods. 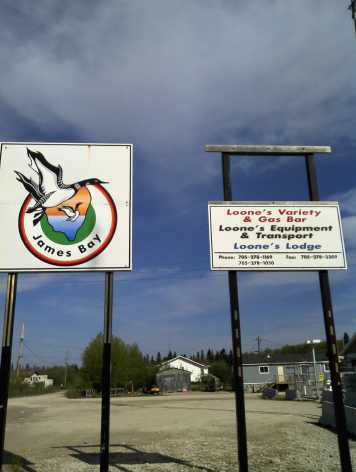 OCNA Blog: So you gave the canoe away in Fort Albany? No problem finding someone willing to take it off your hands? Chris: The plan from the start was to leave the canoe as it was an older one with many fiberglass patches. No problem giving it away, although we kept our paddles as a souvenir! We also gave away our unused food and ammunition. The cost of transporting the canoe was too great, and sometimes you need to wait until the cargo plane can take it, adding days to the trip. OCNA Blog: Your longtime friend and trip partner Gordie has no desire to create an account at Geocaching.com, and log this cache? Thanks very much to Chris for taking the time to answer our questions, we here at the blog really appreciate it. We know he’s been very busy with other such requests, and answering emails from all over the world. He has stated that after he finally logged on to the internet at the Lodge in Fort Albany, he was astounded by the interest in his trip in the Geocaching.com forums, and all the emails he had already received while on the water. He has also stated that he is most touched by people commenting that they were inspired by the trip, and want to challenge themselves, even if it is just a little bit more. We agree. Reading his 29 page journal, with all the excellent pictures, and links to 15 videos posted to YouTube, one can’t help but be inspired; what an amazing journey. Maybe one can even be inspired to take the same trip, after all, he did leave a Geocache at the Ghost River site!